I almost honked at the car in front of me this morning. Again. I was being impatient, but for good reason. I made commitments and needed to get to work for a meeting. I left the house with plenty of time, but I didn’t account for the person in front of me going so slow and then coming to a stop and just sitting there! They were in my way. Have you ever been there? Unfortunately, I usually jump to conclusions in these situations and let my emotions drive my actions. I honk while enthusiastically stating, “Come on! Let’s go already!” out loud as if the person was right next to me. Normally, my wife is next to me though and gives me the look. It’s the unspoken, “Here he goes again” or worse yet, I hear one of my sons in the backseat repeat what I just said. Ouch! That didn’t sound as good out of his mouth as it felt coming out of mine. This time was different. I hesitated for a split second. My hand was actually in the air to push the horn, but I caught myself. The voice of reason in my head actually won! In a split second, I was reminded of the TrAction Plan I had created months ago. Like so many of you that work with us, I have a plan for my personal and professional growth. One of things that I’m working on is being Less Impatient. So, this was a test. Do I give in to the old habit, the familiar tendency to over-react, push too hard, drive too fast, powering through my day and the people around me, or do I slow down for a split second to evaluate the situation before jumping to conclusions? My TrAction Plan actually worked this time. It was no longer just a bullet point on my growth plan, but it became a small victory in the chess match of life. Come to find out, as the minivan slowly moved forward from the stop sign, and I mean slowly, I noticed an elderly woman crossing the street with a small dog. I hadn’t seen them. I jumped to conclusions about the situation and I was wrong. A honk or rant would have been unnecessary and certainly undeserved. Does any of that ring true for you? Have you been impatient lately with someone or pushed a little too hard at work? Does your “road rage” ever surface? I wonder if anyone on your team ever feels as though they are in your way? If you’re like me, you may feel conflicted inside. On one hand, I know I’m impatient and I realize it can damage relationships both at home and at work. On the other hand, leading with intensity and being aggressive has helped me get to where I am today. It’s a big part of my success on a daily basis. So, I’m torn. Sometimes the very thing that helps define our success in business or life can also cripple us when taken to an extreme. I need to continue to learn to leverage my drive and aggressiveness, but be careful that I don’t adversely impact those around me. I would encourage you to be intentional today. Give people the benefit of the doubt more. Listen better. Don’t push with quite so much intensity. Slow down a fraction of a second longer to hear people out and seek clarity before jumping to conclusions. Don’t honk the horn! And finally, what is your plan for growth? Does your team have one? 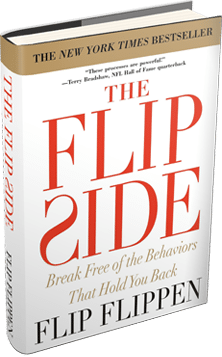 If your wheels are turning and you’d like more information about the professional development we offer at The Flippen Group, please click here or feel free to call or email us at any time.